Let me just tell you, glancing at your resume for the first time in...oh...6 years or so can make your stomach drop. Because though I've been slowly and surely developing a freelance writing resume for some time now, I've pretty much ignored my teaching resume. I can only do so much, after all! They are two totally different resumes. Before I had my son, I taught high school students with learning disabilities and attention disorders. I enjoyed it, especially the progress I helped my students make, but we decided it worked best for our family for me to stay home with our children while they were babies. Fast forward six years. What in the world? They are not babies anymore. My son is now in 1st grade (!!!! ), and my daughter is in preschool. 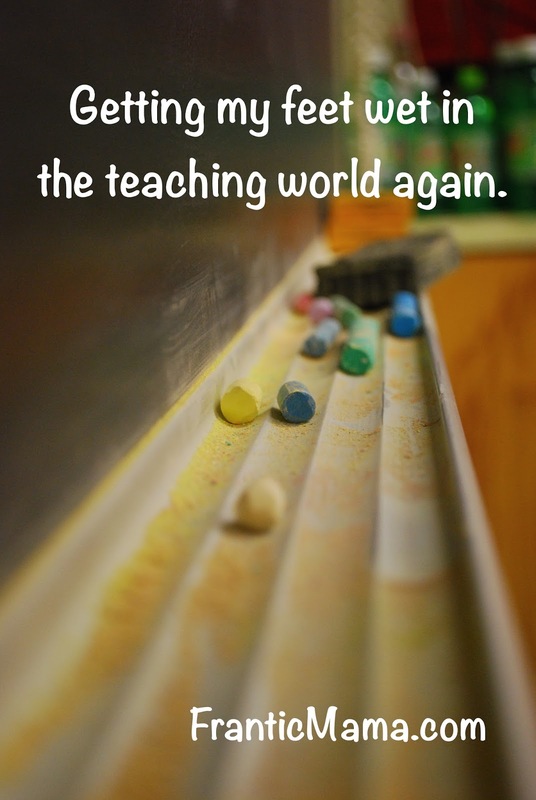 As any teacher knows, teaching is more of a calling than a profession. You don't make a lot of money, and it's much harder than people think it is, but if you are born to be one, you simply can't stay away from it for too long. This summer, I started to get my feet just the slightest bit wet again in the teaching world. I tutored three different high school students, juggling it all around when my kids were occupied at camp or with sitters. Even though it took a lot of childcare and scheduling organization, it felt so good to get back in touch with that part of my life again! So now I'm wading in the waters again, just a little deeper-- tutoring students with reading issues during the school year. That's when I decided to peak at my teaching resume and update it, as I hope to find something part-time at a local school in the next year or so. Guess what? I couldn't find my resume! HAHAHAHA! (<------ maniacal, nervous laughter). That's where I am right now, folks. It's fun, overwhelming, exciting, nerve-wracking, and who knows what else, all churned into one big knot in my stomach. Mostly exciting though. How about you? Do you work full-time or part-time, or stay at home with the kids? Have you re-entered the work world recently? How did it go? Thank you! And what type of resources do you have? I might need all the help I can get :). I am so happy for you Julia! Would you believe, I have never had a resume?! Anyway, I am on my way too starting my own little artsy place soon. And I am just so proud of YOU! Also, I have no idea how I missed so many posts, google plus hasn't been informing me too, and I am so sad about it. And yet happy to have so much deliciousness in one day! Ooooh I want to hear about this little "artsy place" that you are working on! Your Instagram page is so popular, I'm sure whatever way you choose to share your art will be fantastic. Thank you for all of your notes. It is cheering me up on this cold, dreary Sunday to "chat" with you!